A little over a year ago, DIF (Mexican Social Services) brought a young lady to the Home and asked that we’d keep her on a temporary basis, until other arrangements could be made. Realizing that we don’t usually take in older teens, they thought we’d make an exception since two of her younger siblings were soon to be transferred to us from another Home. It was a difficult decision because apparently, they’d had behavioral problems with her in several other Homes in Reynosa, but we agreed. The girl being referred to is Miriam Lizbeth Lucio del Angel, aka: Angela. Not only have we not had any behavioral problems whatsoever, she’s actually become terrific role model. 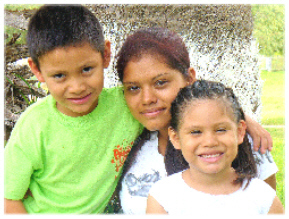 Her main concern is the well being of her younger siblings Nereyda y Valentin. DIF was forced to intervene in this broken home once their “last” father abandoned them; no longer able to tolerate their mothers chosen profession of lady of the night. The children were separated and placed in different Homes. This situation has been especially difficult for Angela, but even so, she has a strong desire to better herself day by day. In January, we enrolled her in a GED type program for Jr. High so that she could get her certificate. To our great surprise, she finished the entire program in less than six months! In her short stay with us, Angela has learned so much about the love of God too. She has accepted Christ into her heart and was even baptized. She wants to serve God, she is active in church activities and is learning to play the guitar so that she can join the youth band. Her greatest desire is to finish her studies, get a good job and take care of Valentine & Nereyda, giving them all she didn’t have. On occasion, she talks about taking them to live with her in a big house, rather than at the Home … though she’ll always be the first to say, that coming to live at Refugio Internacional de Nińos, is the best thing that’s happened to her in her 16 years. Update: Angela is now in her second year at “El Escandon” her grades have continued to improve and we know the Lord has great things planned for this young lady. Please pray she will continue to seek His will for her life.